Harlan Coben is one of the guilty pleasures I have in my reading life. I think of him as a guilty pleasure because I tend to stick to darker, more noirish stories that are published by small presses because their books don’t cater to the masses. Books that end up on the bestseller lists often seem clichéd and formulaic. However, when Coben publishes a new book, I grab a copy and give myself a few days to enjoy the new world he has created. 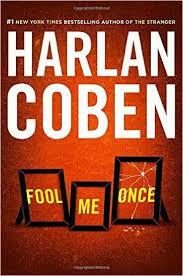 Fool Me Once is typical Coben fare. Tightly plotted, well-developed characters, and enough plot twists to keep you on your toes. Themes tend to run strong in Coben novels and the theme of family and family secrets are evident throughout this book. Maya, a former military pilot, is a witness to her husband’s murder. As police look for answers in his death, Maya is forced to relive painful parts of her own past and begins to question her own recollection of events and ultimately her own sanity. As she races against the clock to find answers, she must determine who is an ally, who is an enemy, and if she may be mistaken people who are close to her for one when they are really the other. Coben’s strengths as a writer is the manner in which he buries clues, juggles multiple plot lines, and ties everything up with a dénouement that both leaves you breathless and leaves you replaying the clues you found throughout the book to ensure they all fit. True to Coben’s nature, they all fit in this one and as you piece them all together, you recognize the genius that is Coben. This book is a blast to read and lets all Coben fans know he is still at the top of his game. While most readers of this site would agree that dark noir is king of the genres, everyone should be able to find enjoyment in this one.